Starfighter Decals has re-issued some decal sheets for those who like to work with 1/350 to 1/700 scale U.S. Navy aircraft. The decals are tiny and precise. Registration is exact in all situations; they’re perfect. The decals are packaged with tissues interleafed with the decals sheets to protect the decals. Everything appears fine. The one thing I don’t like is that most of the plastic bags that hold the decals have flaps sealed with adhesive. They’re good to hold the bag shut until you buy it and open it. I don’t think they’re made to be resealable. In one case, I was simply trying to open the bag but tore a large hole in it while opening it, not a good thing. Also, if you don’t use all the decals and plan to put some back into the snug bags, you may find the sheets getting hung upon the adhesive, creating some aggravation. Only one set of the Starfighter Decals had a Ziplock-style resealable bag. 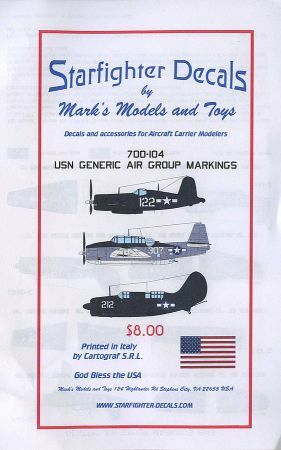 This set of silk-screened 1/350 scale decals are used for generic markings on 90 U.S. Navy WWII aircraft including SB2C Helldivers, TBM Avengers and 70 F4U Corsairs or F6F Hellcats. 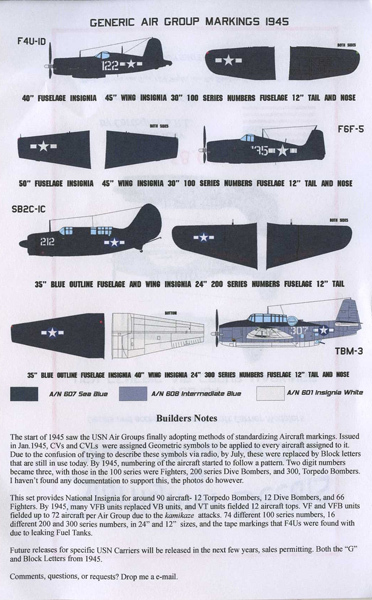 Sheet 350-A has individual airplane numbers, in black and white, plus markings for air group commander aircraft and the fuel tank tape markings seen on F4U Corsairs. Our thanks to Starfighter Decals for providing the review sheets.